Lectio Divina — The Contemplative Life. Lectio Divina is a method of prayer that uses Sacred Scripture to facilitate one's relationship with God. This form of spirituality is distinctly Catholic, but similar methods are found in other theistic religions. Traditionally, there are four steps in the process – lectio, meditatio, oratio, and contemplatio. Each step is often thought of as "rungs on a ladder" leading up to the pure "experience of God" in contemplatio. The process is also sometimes conceptualized as circular, with each step enhancing the experience of the others. "But the fruit of the Spirit is love, joy, peace, patience, kindness, goodness, faithfulness, gentleness, and self-control." After one slowly and deliberately reads and re-reads the text, they move to the next step in Lectio Divina – mediatio, or "meditating" on the text. In this step, one continues to "chew on" the text, pondering its meaning. In the passage above, one may meditate on the true meaning of "patience" and how that plays out in the world. The practitioner focuses on whatever part of the text they are drawn to, and the specific section that grabs their attention is often thought of as being guided by the Holy Spirit. Throughout the entire process, one strives to be open to how the Spirit leads them through the text. Meditatio naturally leads to oratio – "praying the text." In this step of Lectio Divina, the person has a "conversation with God" about the text. The goal of this part of Lectio Divina is to discover what the text means to me. In the example above, one might listen to God address how they need to be more patient in a specific area of their life. Oratio is a back and forth with the Spirit of God. The process of lectio and meditatio prepares the soul to enter into this discussion, and oratio is deeper than mere "thinking about a text." This step is conceptualized as a true relationship with God. The final step in Lectio Divina is contemplatio – "contemplation." In the Christian tradition "contemplation" doesn't mean "thinking deeply about something," but rather the opposite – moving beyond thought to an experience at a level deeper than the mind. In the process of Lectio Divina, contemplatio is often referred to as resting in God, beyond thoughts, beyond words, beyond images. One can dispose themselves to contemplatio by willingly opening themselves to the experience, but the experience itself is seen as a pure gift of God, which He gives at the times and in the measure that He chooses. 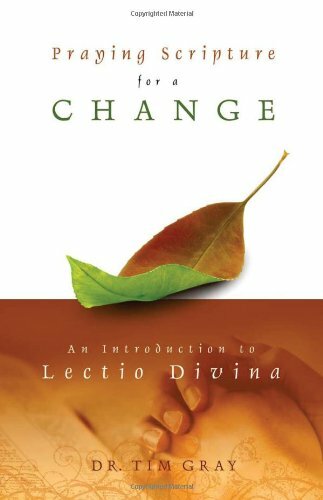 Lectio Divina is often associated with the Benedictine monastic tradition of Catholicism. Although sometimes thought of as a method only suitable for monks, there has recently been a strong push in Catholicism to bring this type of prayer to all within the faith.